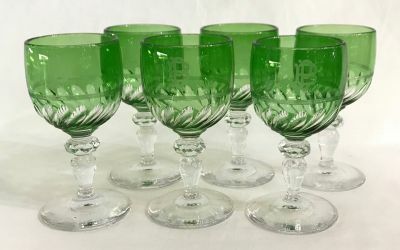 Victorian hand blown and cut wine glasses. Vibrant emerald green cased bowl on a faceted stem, rising from a simple base. English, circa 1880. Monogrammed “PB”. 4 1/2” high, 2 1/4” diameter at the rim. $595 for the set of 6.